I had occasion to visit Ojai Valley Inn & Spa not of my own accord, but on invitation to spend the night there after attending the Papabubble candy-making workshop one Saturday afternoon. That is, not before enjoying a special meal in the resort hotel’s main restaurant (of a total 4), Maravilla. The resort itself is a special place tucked away in that green valley, with Maravilla helming its top-notch cuisine. 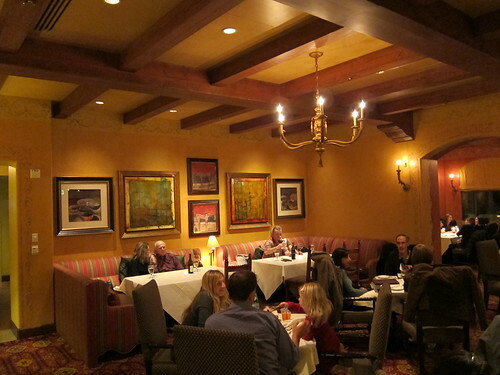 The hotel is not for the slight-of-wallet – a room with a fireplace will run you $600 – so it should make sense there would be a minimum standard attached to the restaurant nestled within that retreat. The great thing, though, is Maravilla meets that posh standard. The ambiance of Maravilla is warm and welcoming – and its dishes do well to embody that same mood. I was very impressed with Executive Chef Jamie West‘s menu and the execution of at least the dishes that came to our table. The service was impeccable all night (granted, it was a bit of a media review arrangement but everyone else dining seemed to also be pleased). We started off with the soup of the day: French onion. It was deliciously smoky and the onions were sweet, carmelized and perfect. While part of me wished for a pot covered with a layer of cheese, the complex flavors of the soup were more than enough to keep me intrigued. 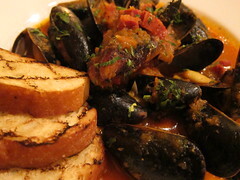 Another starter we had was the Mediterranean Mussels – which, surprised my dinner companion Bridgette that they were to her liking as she hasn’t been “a mussels kind of person” prior to this meal. The broth was compelling, though, and had a good, weighty kick to it thanks to the spice in the chorizo and paprika. 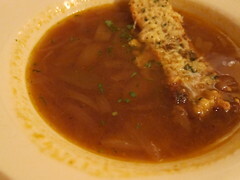 We sopped up the mussel broth as well as some french onion soup with the accompanying bread. 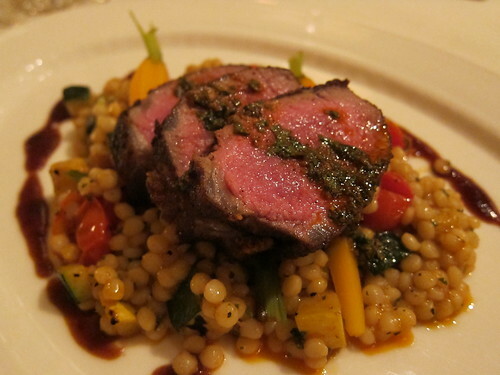 The Moroccan Spiced Lamb Loin (title picture) came highly recommended and with good reason. It was perfectly cooked with the appropriate rings on the inside of the cut and the meat itself was awesomely tender without hardly any gamey consistency whatsoever.Â It ranks up there with the best lamb I’ve ever had. Additionally, the cous cous bed it lay atop was a surprising treat; I’ve rarely had cous cous cooked to exactly the right texture as I had at Maravilla. Each one was spritely to the bite and the vegetables added vibrantÂ flavor, as well. The Pan-seared Scallops were also perfectly cooked, with very tender inner meat. 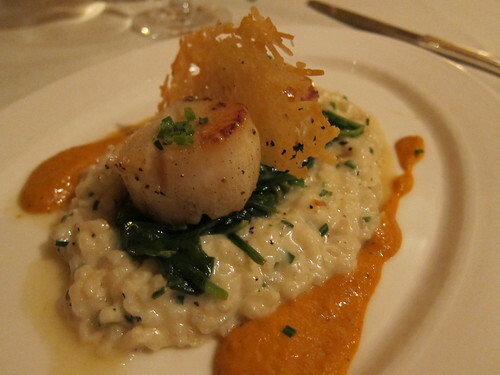 The risotto was hearty and indulgent – a perfect creamy bed for the scallops. The spinach added a nice acidity since it was cooked with a lemon garlic sauce and the romesco gave it a subtle kick Overall, it was a perfectly-balanced, soothing seafood dish. 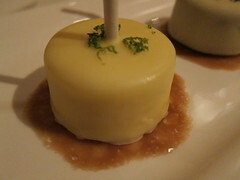 Dessert was next – and as a creme brulee fan, I couldn’t not order a certain selection on their dessert menu. 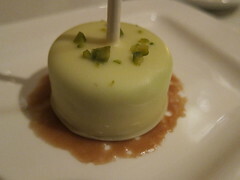 That item was: Flavored creme brulees on a stick – yuzu, pistachio and cookies & cream – which were like popsicles with a delicious outer shell and creamy, eggy center. A perfect end to our meal. You may or may not have occasion to visit Ojai Valley Inn & Spa, but it’s really a perfect getaway without the excessive drive. The views back from Ojai along the 101 on a day when the rain was just letting up was probably the most beautiful short drive I’ve ever had in my time in South California. No matter what, your meal or meals at Maravilla will ingrain Ojai in your memory. All aforementioned food and wine was hosted. This entry was posted in Food, Ojai and tagged Chef Jamie West, Dinner, Executive Chef Jamie West, Food, Maravilla, Ojai, Ojai Valley Inn & Spa, resort, restaurant. Bookmark the permalink.